Can you separate the 2 parts and bring them back to start. The two entangled pieces are exactly the same in shape and very simple. They look like hooks used to hang things. The pieces can be separated and connected, in a fascinating and magical series of movements. 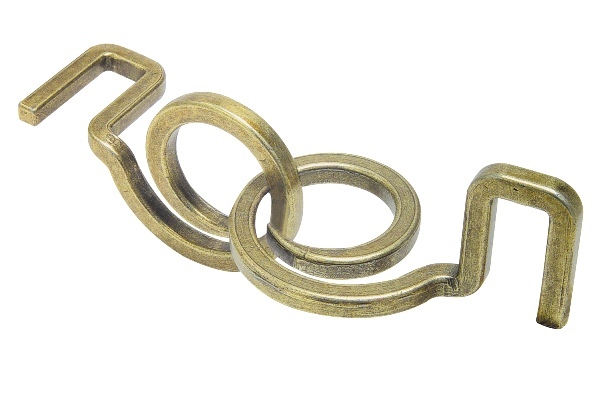 This cast puzzle, which is simple yet mysterious and just like a disentanglement puzzle, was created by Finland's Vesa Timonen. The theme of this puzzle is "Hook." Level 1/6. Package size: 7,5 cm x 11,5 cm x 4,5 cm. This product was added to our catalog on 18.09.2009.